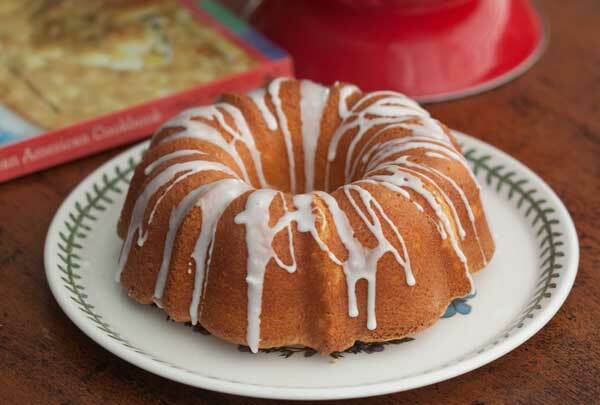 7-Up Pound Cake is a traditional pound cake made with soda. This version calls for a little extra lemon zest and a glaze. Preheat oven to 325 degrees F. Grease and flour a tube pan or Bundt pan. With an electric mixer, beat the butter and sugar until creamy, then gradually add the oil and continue to beat for another minute until creamy. Alternately add flour and 7-Up. Mix after each addition (I mixed with my spatula scraper). Bake at 325 degrees F. for 60-90 minutes or until a skewer inserted comes out clean. Let cool in pan for 10 minutes, then remove from pan and let cool completely. Drizzle with glaze. To make the glaze, mix together 1 cup powdered sugar and about 2 tablespoons of lemon juice or just enough to make it thick enough to flow from a spoon. For the flavoring, I used ½ teaspoon of vanilla and 1 teaspoon of Boyajian lemon oil. I also added a teaspoon of lemon zest and a bit of yellow food coloring paste. The recipe can be made in a tube or Bundt pan or halved and baked in an 8x4 inch loaf pan or 6 cup Bundt. Also, if you make the full recipe with unsalted butter instead of salted butter, add a little under a teaspoon of salt to the batter.